The Lenzing modal knit fabric is finely knit, super luxurious fabric used to produce apparels for everyday life. This fabric feels extremely soft on the skin and is one of the most breathable fabric. When compared with ordinary cotton fabric, modal fabric absorbs 50% more moisture and hence it is used in produced apparels like pyjamas, bathrobes, towels, bed sheets, baby clothing and lingerie and so on. The specialty of the Lenzing modal knit fabrics is that it is shrink resistant and stays in shape even after repeated usage and washing. The production materials are procured in such a way that ensures environmental sustainability. Hence, the fabric is practical and eco-friendly. 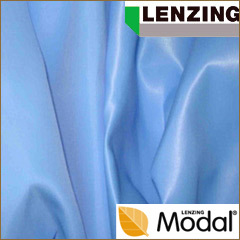 Apart from the Lenzing modal fabric, we also manufacture and supply yarns and fabrics such as: Cotton Slub Yarn, Linen/Tencel Yarn, Lenzing Viscose Yarn, Vortex Yarn, Indigo Denim Knit Fabric, Pilling-free Knit Fabric etc., that are soft, low in pilling, color-fast and Shrink resistant.